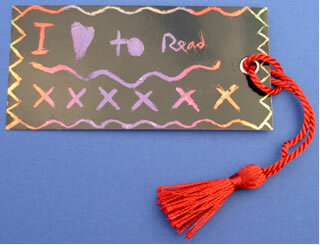 Bookmarks can be plain white card or made from bright scratch art material. They can be decorated in numerous ways with pens, stickers, pencils or paints to name but a few. The scratch art bookmarks are specially coated for children to ‘scratch’ out their own message or design and reveal bright rainbow colours. (Not suitable for children under 5).